Era is a dice game by Matt Leacock. For 1-4 players, ages 14 and up. 75-120 minutes. Construct the most prosperous medieval city by constructing buildings, accumulating culture and avoiding disasters. • The first ‘ROLL and BUILD’ game. 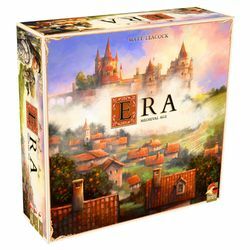 • Based on the original and very successful game ROLL THROUGH THE AGES by Matt Leacock (designer of Pandemic). • Over 100 Fabulous 3D building mininatures.